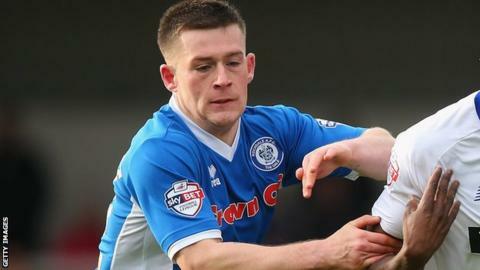 Rochdale came from behind to inflict a seventh straight league defeat on bottom club Colchester. Captain Chris Porter volleyed the visitors into the lead before Ian Henderson converted a spot-kick after Porter was penalised for a foul on Peter Vincenti. Rochdale took the lead when Donal McDermott fired an effort underneath Colchester keeper Jamie Jones. Dale sealed the points when Olly Lancashire poked in from close range. "It was a hard grind today. It was a no-win situation for us today as we were expected to win, but I have a lot of respect for Colchester and the way they play. "I think the team's a very good team that scores goals, so it's a very good three points today. "Donal McDermott was very good. There's a little bit of inconsistency with Donal, but I'm happy to nurture him and give him an opportunity. I think if we do, we'll get some real good product out of him." Match ends, Rochdale 3, Colchester United 1. Second Half ends, Rochdale 3, Colchester United 1. Hand ball by Matthew Lund (Rochdale). Matthew Lund (Rochdale) wins a free kick on the right wing. Foul by Macauley Bonne (Colchester United). Corner, Colchester United. Conceded by Oliver Lancashire. Matthew Briggs (Colchester United) wins a free kick on the right wing. Corner, Rochdale. Conceded by Richard Brindley. Attempt missed. Callum Harriott (Colchester United) left footed shot from outside the box misses to the right. Hand ball by Andrew Cannon (Rochdale). (Colchester United) wins a free kick in the attacking half. Corner, Rochdale. Conceded by Tom Eastman. Attempt missed. Chris Porter (Colchester United) left footed shot from the centre of the box is close, but misses to the left. Corner, Colchester United. Conceded by Donal McDermott. Substitution, Colchester United. Macauley Bonne replaces Marvin Sordell because of an injury. Corner, Rochdale. Conceded by Matthew Briggs. Matthew Briggs (Colchester United) is shown the yellow card for a bad foul. Substitution, Colchester United. Dion Sembie-Ferris replaces Gavin Massey. Substitution, Colchester United. Marvin Sordell replaces Joe Edwards. Goal! Rochdale 3, Colchester United 1. Oliver Lancashire (Rochdale) header from very close range to the top left corner. Assisted by Calvin Andrew. Corner, Rochdale. Conceded by Alex Gilbey. Corner, Rochdale. Conceded by Joe Edwards. Ian Henderson (Rochdale) wins a free kick in the defensive half.